CHECHESMITHNATION : Beautiful Adaeze Yobo Is So In-style Repping Swanky's Signatures Stylish Piece! 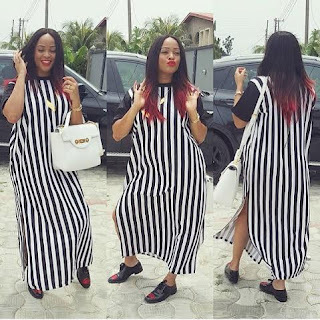 Beautiful Adaeze Yobo Is So In-style Repping Swanky's Signatures Stylish Piece! We are in love with this striped shirt dress from Swanky's, "the celebrity stylist's" ready to wear collection. Mrs Yobo, paired her look with a cute oxford flats that featured a pop of red, and a white hand bag to go. Rock on girl!